You Might Also Enjoy:Paleontology Unit Study BundleSouth America Unit Study BundleAntarctica Unit Study BundleElectricity Unit Study BundleVISIT MY STORE and follow me to hear about new curriculum and sales!FOLLOW ME ON PINTEREST to get inspiring ideas for your classroom! 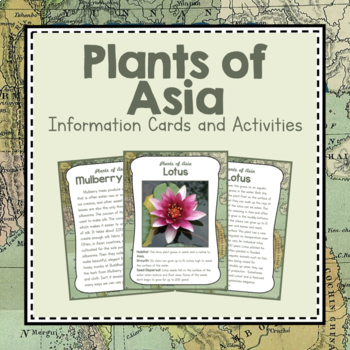 A great set of vivid Asian plant cards that can be used in continent study boxes or centers or for a unit study on Asia. 12 plants are included in the set. Each card is double sided. 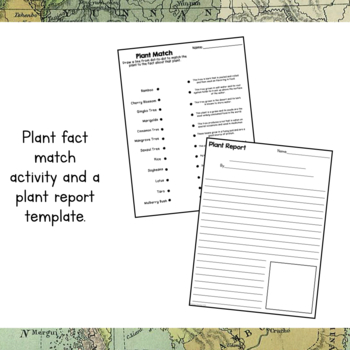 The front has a realistic photo with basic information and the back has a mini-article featuring interesting and unique information about each plant. 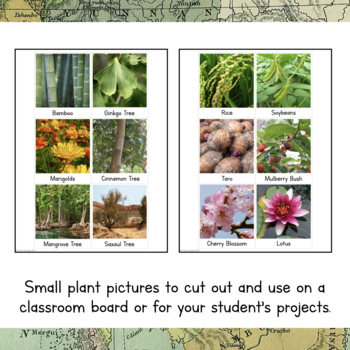 Worksheets and activities are included at the end of the packet including a set of small pictures to put up around your classroom map of Asia. PDF format. 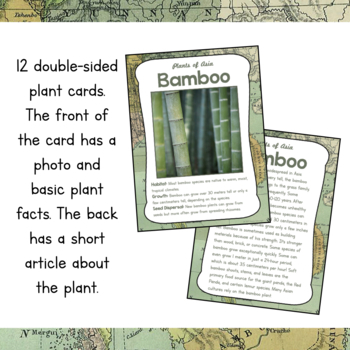 12 double sided information cards about plants of Asia including: Bamboo, Gingko Tree, Marigolds, Cinnamon Tree, Mangrove Tree, Saxaul Tree, Rice, Soybeans, Taro, Mulberry Tree, Cherry Blossom, and Lotus. 12 small photo cut-outs of the plants to put around your map. VISIT MY STORE and follow me to hear about new curriculum and sales! FOLLOW ME ON PINTEREST to get inspiring ideas for your classroom!